Rami Khouri, internationally acclaimed journalist, commentator, author, and professor at American University of Beirut, speaks with clarity and authority on the challenges facing journalism — and journalists — today. Tickets are $5.00 and FREE to students, educators and journalists. Call (231) 947-3446 to reserve your seat. Be sure to mark your calendars for these two important events recognizing our outstanding students and graduates! 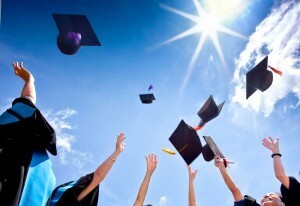 Honors Convocation will take place on Friday, May 3 with the reception starting at the Dennos Museum’s Sculpture Court at 4:45 p.m., followed by the awards ceremony at the Milliken Auditorium at 5:30 p.m.
Commencement will be held Saturday, May 4 at 2:00 p.m. in the gymnasium at Traverse City Central High School. The public is invited to attend, or can watch the ceremony streamed online here. Come enjoy a guided tour of Orna Ben-Ami’s exhibit, Entire Life Package, and the Inuit art that we have on display at the Dennos Museum. Entire Life in a Package is the story of millions of refugees with millions of packages, suitcases, sacks — “Life packages” that hold the desire to survive. 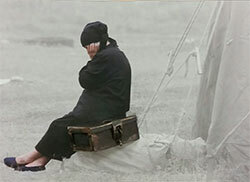 In it, they pack both hopes and pains. Behind every package there is someone looking for a place. The objects that people take, in one package, represent their identity and sense of belonging, their memories and hopes for the future. Join us for a free screening of Line 5, Barton Bund’s three-part series, followed by free refreshments and an informal community discussion in Scholars Hall room 217. Doors open at 5:30 p.m. with refreshments following the film. 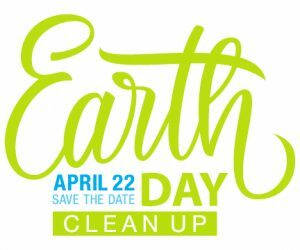 Monday, April 22, 10 a.m.-2 p.m.
Show some Hawk Owl pride on Earth Day by doing your part to clean up our beautiful campus! Volunteers will be on hand in the Health & Science Atrium and Osterlin Library to assist you with everything you need to lend a hand with on-campus trash clean up! Many hands make light work! Post a photo on Instagram of your clean up efforts and use the hashtag #NMCEarthDay to be entered into a prize drawing for a $50 Amazon gift card! 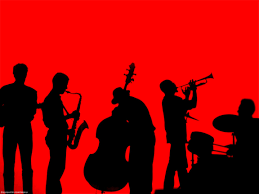 NMC Jazz Groups will be in concert Saturday, April 20 starting at 7:30 p.m. in Milliken Auditorium. The Dennos Museum Center welcomes NMC faculty, staff, and community members back from spring break 2019 with a special discount for our upcoming concert with Aguankó on Friday, April 5. 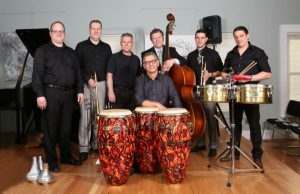 This Detroit-based band, led by percussionist and composer Alberto Nacíf, is steeped in the tradition of jazz infused Son-Salsa. So bring the whole family for a wonderful night of Latin music and dancing. They will be performing for hundreds of local K-12 students in the morning, followed by the public concert at 8 p.m. 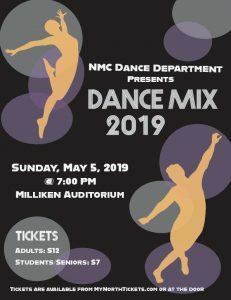 Following the link below, you can enter the code NMC to receive a 50% discount on all tickets. 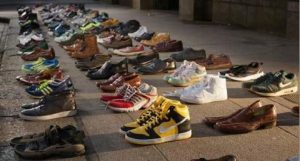 Bringing suicide awareness closer to home, one empty shoe at a time. Suicide affects nearly every individual, though the signs are not always clear. 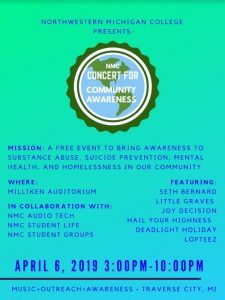 A panel of local community experts will come together to provide support, resources, and information on this pressing issue. Join us in bringing together a broken community and learn how to help those in need. 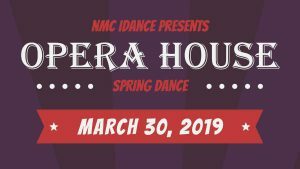 Wednesday April 17 at 6 p.m.
Come enjoy a night of slow, waltz, salsa, tango, swing and other Latin dancing hosted by NMC’s iDance student group. Costumes encouraged but not required. The theme is ‘The Greatest Showman’. 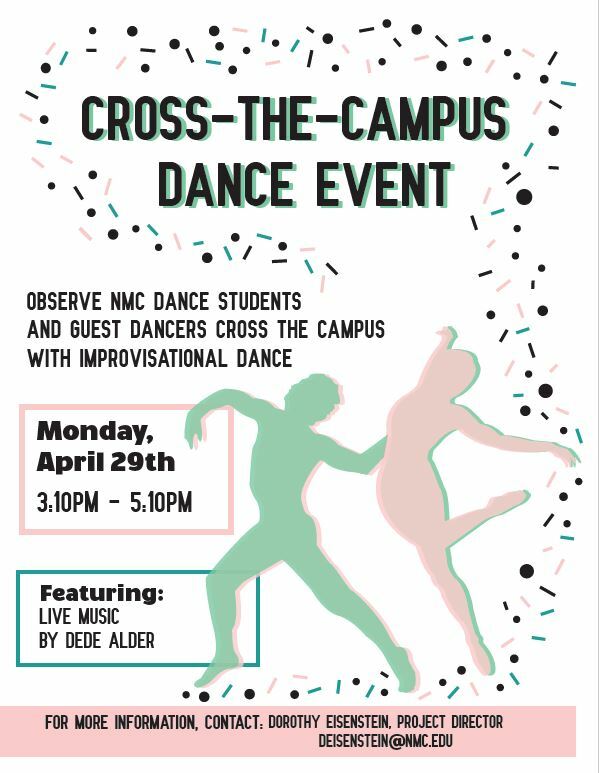 From 6 p.m. to 7:30 p.m. we will feature a Mykl Werth Movement (MWM) basics workshop taught by Mykl Werth and dips and tricks workshop taught by Ashley Urbanus and Jon Vanhoose. Open dance then begins at 8 p.m., ending at midnight. 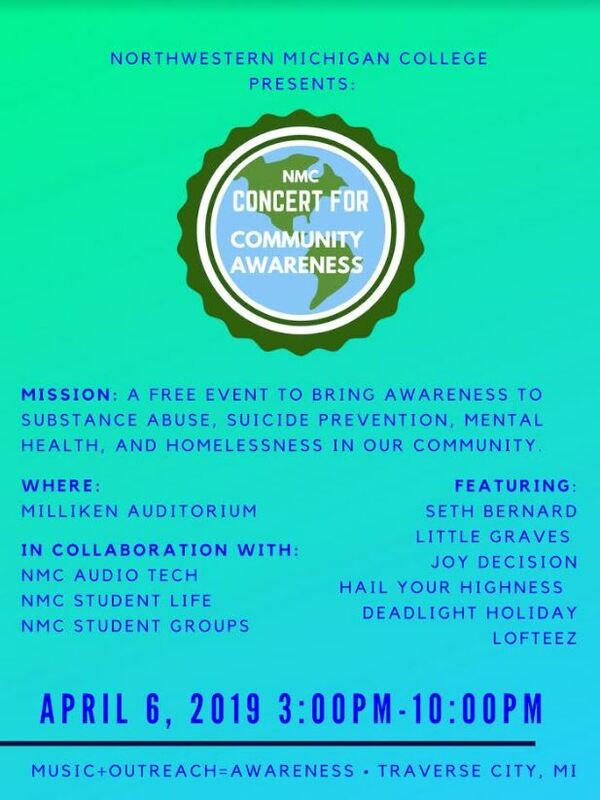 NMC Audio Tech students are collaborating to bring the Concert for Community Awareness to our campus. 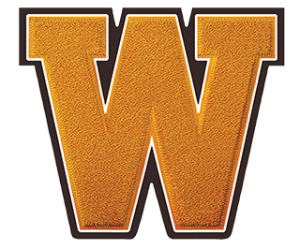 The mission is to bring awareness to substance abuse, suicide prevention, mental health and homelessness in our community. Featuring: Seth Bernard, Little Graves, Joy Decision, Hail Your Highness, Deadlight Holiday and Lofteez. This is a free event that allows you to come and enjoy at any time throughout the evening. Join us April 6 at Milliken Auditorium from 3-10 p.m.
Communication is key in all relationships. Mike Domitrz, founder of The Date Safe Project, presents a powerful free program through honest discussion and humor that teaches you how to ask for what you want — without having to play any of the games. 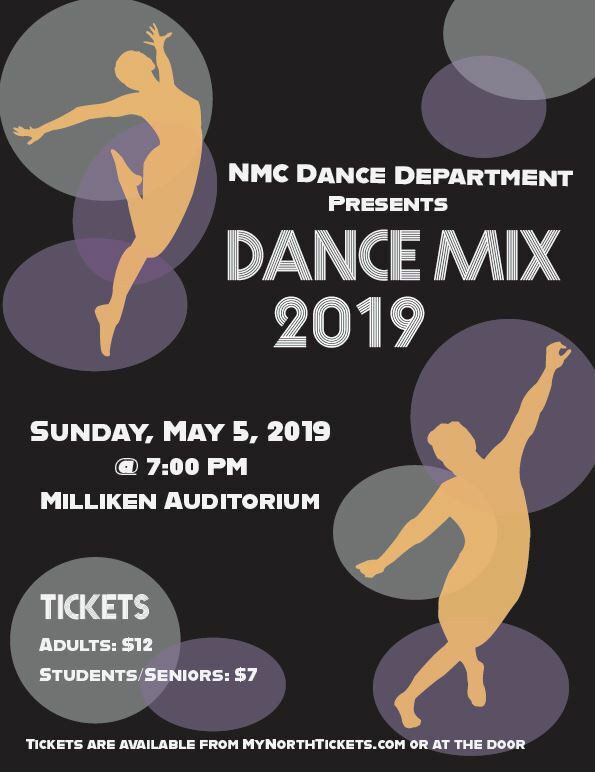 For more information, contact NMC Student Life at (231) 995-1118. Sponsored by the Michigan DHHS Campus Sexual Assault Grant Program. 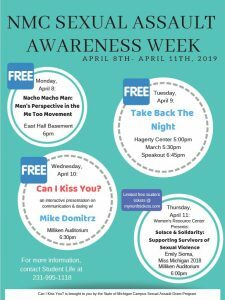 NMC’s Office of Student Life will host four events on their campus the week of April 8-11, 2019 as part of Sexual Assault Awareness Month. This week aims to educate students through connections to resources, dialogue and information on how to prevent sexual violence and advocate for those who have been impacted. 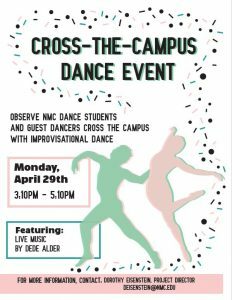 These events will also provide a safe place for students to learn about topics such as consent, healthy relationships and dating.